Did anyone else hear that? That was the sound of my heart being yanked viciously out of my chest and then thrown into my face. I was on the last few pages of this book when I dropped it. I picked I up, and because my bookmark did not stay in place, I flipped to find my page – and got spoiled. Hard. I mean, character death spoiled. I put the book down and walked away. Yeah. WALKED AWAY. I couldn’t read that kind of ending and then go to sleep. This book was fast paced and a quick read. I liked Adelina. I liked that she wasn’t perfect inside or out. I liked the side characters, however I found that I kept mixing up the two female side characters. The “markings” thing was fascinating to me. They have markings on their body, strangely colored hair, and they stand out – and people fear them for what they can do. Love it. I love that Adelina could also be the villain – she’s not Supergirl and bent on saving the world and every person, bunny rabbit, and kitten in it. Her character is refreshing, terrifying, and I love her. The concept of this book was fantastic! The world – while at times felt like info-dumping – was… well, it was a bit dull, but it felt well-rounded when it needed to be. The story moved fast, too fast to linger on scenery or world-building, which I found refreshing. But the ending – AH! I’ve already got the next two book on hold at the library, but they won’t be coming at me immediately. 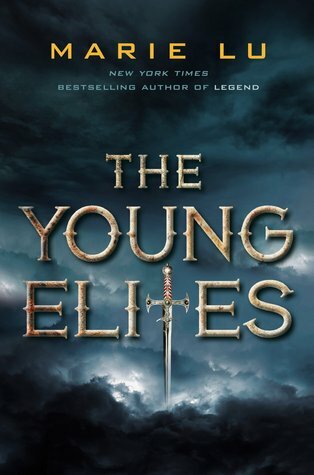 I did not expect to fly through The Young Elites like I did, but pleasantly surprise. If I took a shot each time “a memory came back to me” appeared I’d be smashed. Not that I don’t enjoy a good flashback, but this book had a few too many for me. That, coupled with the odd “my alignment to passion” emotional telling parts, where she suddenly had this ability to sense other people’s emotions. To me, that came off as a cheap way for the protagonist to inform the reader of other characters’ emotions. Overall – an amazing read. Perfect for a stormy afternoon. Quick, fast-paced, just the right length for what is it, and I love the wrenching emotions that it put me through. I know I put the book down because of them, but to be able to evoke that strong of an emotion – wow! I don’t get those emotional highs from real life, so this is as close as I’m going to get. So, overall, a 4 out of 5. Yes, I’ll be checking out the series.